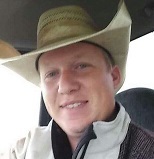 OVALO: Justin Wayne Mooney, 27 took flight with his newly adorned Angelic Wings on April 14, 2018 at 9:45 am. Justin entered this world on January 22, 1991 in Ventura, CA the son of Allan Mooney of Ovalo and Karen Fricke of New York. Justin is survived by his sister Nicole Beittenmiller (Chris) of Tucson and his eight brothers: Allan Mooney Jr. of Tucson, Matthew Mooney (Lacee) of Ovalo, Alexander Mooney of Ovalo, Jacob Mooney of New York, Brandon Mooney (Lauren) of Amarillo, Benjamin Mooney of Ovalo, Joseph and Justin Humble (mother Marcee) of Ovalo, and his professed brother Steven Sneed whom meant the world to him and the Mooney family. Justin was a farmer, Rancher and cowboy with amazing talents, he has many friends, and the biggest heart. His smile was infectious, but his words were always straight even when they hurt. A visitation will be held at Fry-Smith Funeral home on Wednesday, April 18, 2018, 5 to 7pm. A memorial service will be held on Thursday, April 19, 2018, 10:00 am. at the ranch he called home; 602 FM 614, Ovalo, TX 79541.